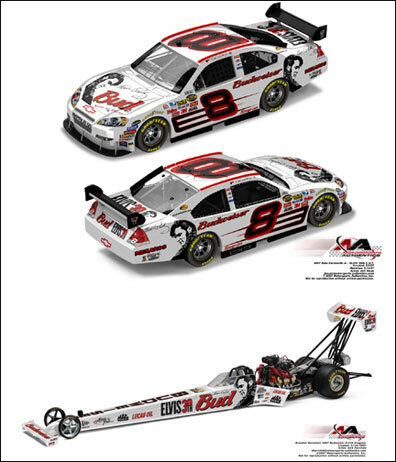 Earnhardt And Bernstein To Race Elvis Schemes - Misc. A press release from Anheuser Busch: The King of Rock ’n’ Roll will roll with the King of Beers when NASCAR’s most popular driver Dale Earnhardt Jr. and NHRA young gun Brandon Bernstein pilot commemorative Elvis Presley’s 30th Anniversary paint schemes on the #8 Budweiser Chevrolet and Bud King Racing Top Fuel dragster in September. Earnhardt’s #8 Budweiser Chevrolet is a predominantly white scheme with black and red highlights and features Elvis’ image on the hood and rear quarter panels, plus the King’s image and “Elvis 30th” on the deck lid for the Chevy Rock & Roll 400 at Richmond International Raceway on Sept. 8. A custom Elvis themed helmet and black driver firesuit includes the young Elvis’ silhouette on the torso with Budweiser in red down each leg. The car will be unveiled Monday, Aug. 13 on the front steps of Elvis’ Graceland home, and be on public display during Elvis Week in the Elvis Auto Museum, Aug. 14-18. “I grew up an Elvis fan, so to get to race a car with his image on it at one of my favorite tracks is pretty cool,” said Earnhardt, whose most recent win came at Richmond in May of 2006. “I think the car looks sharp, and I hope Elvis fans worldwide appreciate Budweiser’s tasteful tribute to the King.” Bernstein, a four-time winner in 2007, also will celebrate Elvis Week with a similar white paint scheme and matching white Elvis themed firesuit for the Bud King Racing Top Fuel dragster during the NHRA MAC Tools U.S. Nationals, Aug. 29-Sept. 3 in Indianapolis. Earnhardt and Bernstein will rev up the 30th Anniversary Elvis Week celebration by hosting the first night of the “Elvis Music & Movies” series on the front lawn of Graceland on Aug. 13. “Elvis Music & Movies” marks the first ever Elvis Week entertainment event inside the gates of Presley’s famed home in Memphis. In addition, Budweiser will honor Elvis’ passion for horses with a visit by the Budweiser Clydesdales, which will be stabled in Graceland’s main tour center area for public viewing Aug. 14-18. Earnhardt and Bernstein will discuss racing, their love of Elvis music, introduce some favorite songs, and interact with the evening’s entertainers. Following the live performances, Earnhardt will introduce the Elvis movie Viva Las Vegas which has been restored and digitally remastered as part of a new release of Elvis movies from Warner Bros.